When I went to look at it in late January of 2008, it didn't seem to match the photos or description of the Matinicus boats in either Chapelle or Gardner's books, but I bought it anyway. 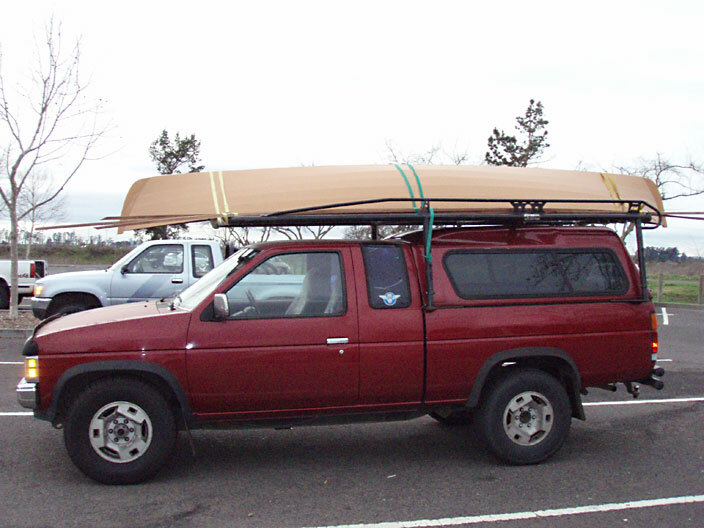 My dory skiff is a great sailing boat, but is often three times heavier than the marine ply pulling boats that I row with at TSCA events -- and I'm tired of rowing up to the beach or dock as the last boat. I posted some photos on the Wooden Boat Forum, asking "What did I just buy?" 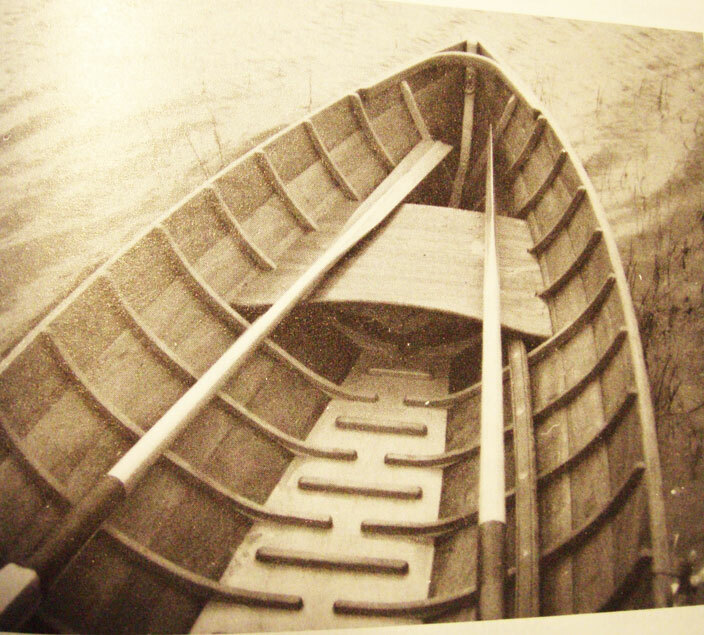 At home we were flipping through the pages of Gardner's _Building Classic Small Craft_ when my wife noticed that the boat seemed identical to the Herreshoff Rowboat as drawn and modified by Gardner. Eureka -- that proved to be the correct design! 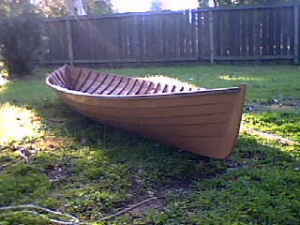 The Herreshoff Rowboat as modified by John Gardner is 17' long, 46" wide, and 17" wide on the bottom. It has a great reputation as a very fast rowing boat -- somewhere between a racing scull and a stock rowobat. 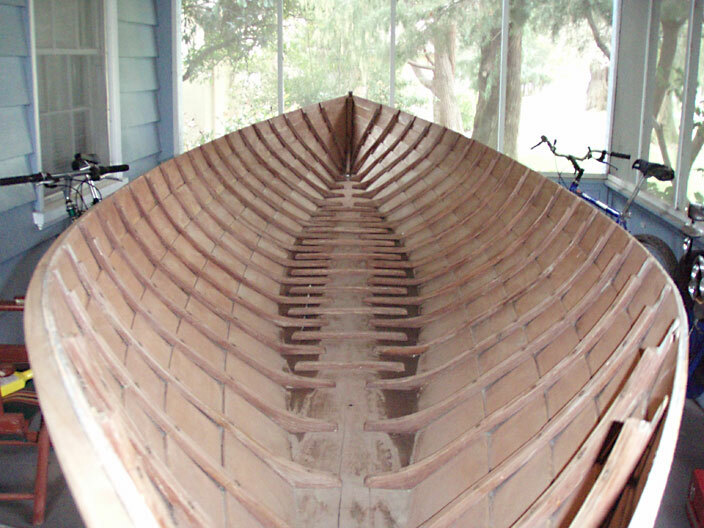 But this particular boat is modified even more, being 15' 8" long, 45" wide, and 14" wide on the bottom, which means it will be slightly less stable and not as fast as the longer boat. As you can see, the interior framing matches the Herreshoff plans and old photos exactly. 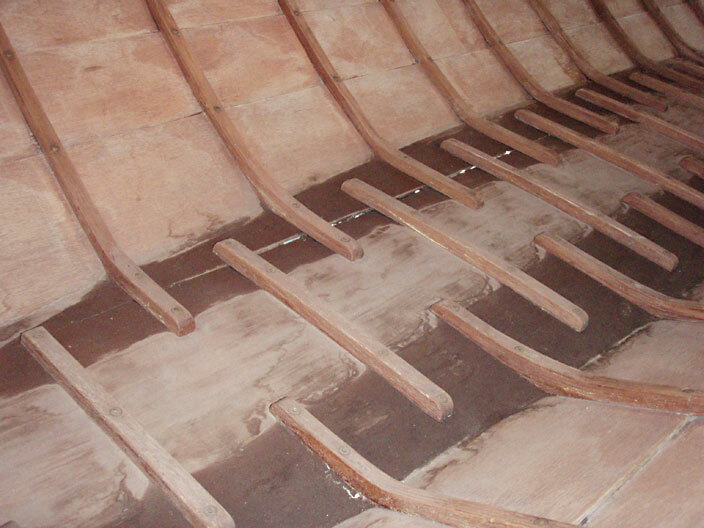 The boat still needs an inwale, outwale (rubbing chine), seat risers (supports), breasthooks, thwarts and oarlocks. Here you can see one of the stems (both ends are identical so there is no bow or stern), and the frames notched for the inwale. The hull is occume marine plywood, copper riveted to the laminated wood frames. The bottom cleats are solid oak riveted to the bottom plank. The bottom is a wide plank of white, northern or yellow pine, and according to the previous owner it cupped in the fierce Central Valley's California heat. This caused a split in the plank, visible with some white sealant coming through. 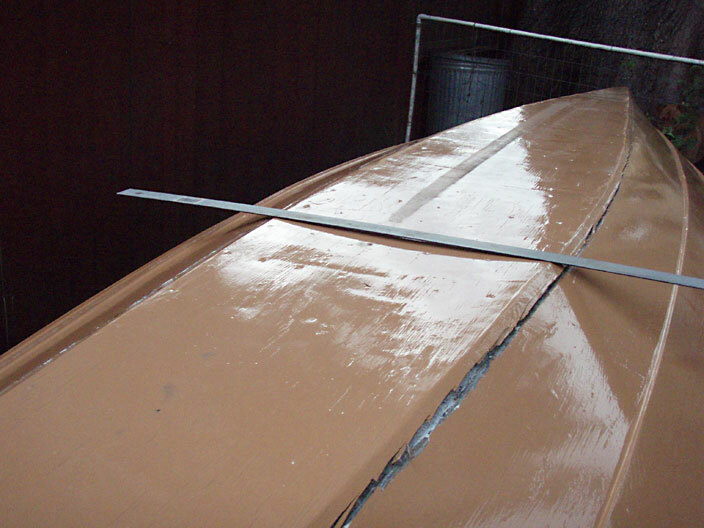 The cracked plank is about 1/2" higher on the hull side than on the center part of the plank. Here you can see the cupping of the bottom plank and the marine ply false bottom, and how it pulled away from the sides. 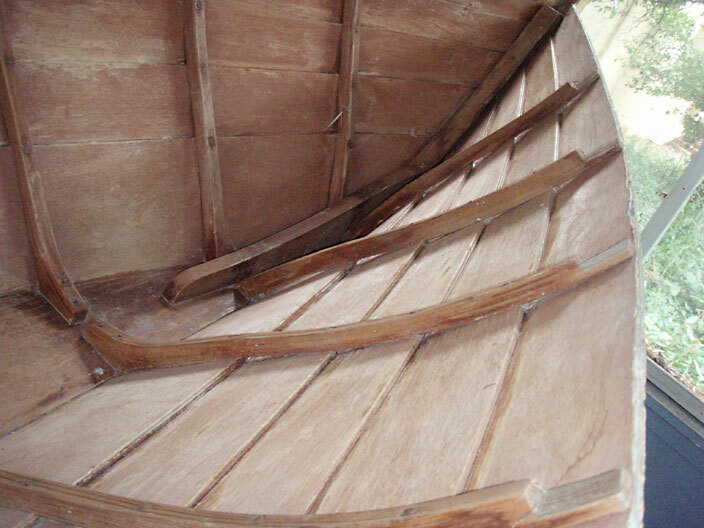 The Wooden Boat Factory website shows a complete build of the stock 17' Herreshoff Rowboat, following the plans exactly down to the unique hinged thwarts that allow the boat to be rowed either direction. Check out the detail photos on pages 6 and 7 on their site. The Maine Boats, Homes and Harbors website shows a few photos of another Herreshoff Rowboat by Stephen Florimbi Boatbuilding. Photos are at the link at the end of the article.